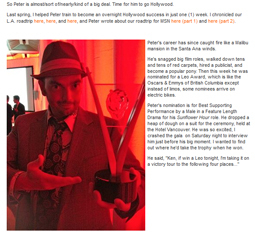 Peter's career has since caught fire like a Malibu mansion in the Santa Ana winds. 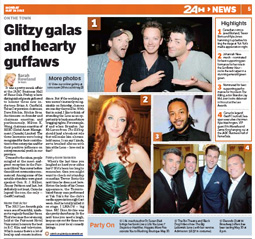 He's snagged big film roles, walked down tens and tens of red carpets, hired a publicist, and become a popular pony. 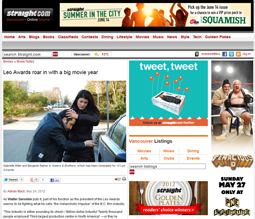 Then this week he was nominated for a Leo Award, which is like the Oscars & Emmys of British Columbia except instead of limos, some nominees arrive on electric bikes. 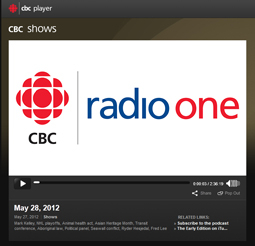 Mon, May 28 : The latest news from the entertainment news, with Erin Cebula. 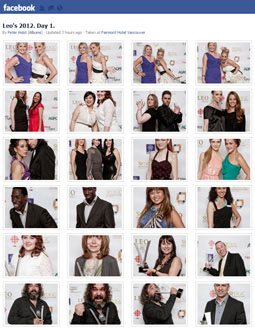 The largest regional awards ceremony in North America that celebrates excellence in the TV and film sector, B.C. 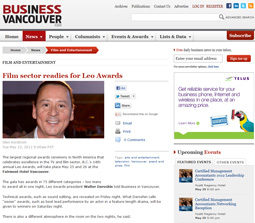 's 14th annual Leo Awards, will take place May 25 and 26 at the Fairmont Hotel Vancouver. 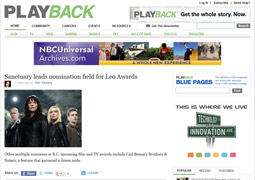 The Carl Bessai film took home six awards, including best feature drama, while Blackstone nabbed four TV trophies, including for best dramatic series (Story updated with clarification). 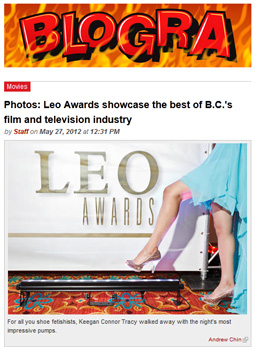 It wasn't exactly a red carpet, but it had that red-carpet feel last night at the annual Leo Awards, which celebrate the best of B.C. 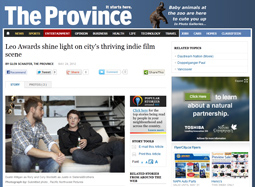 's film and television industry. 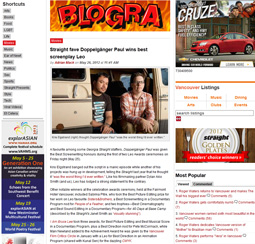 For a full list of award winners, go here. But if you just want to gawk at the outfits, just start scrolling. 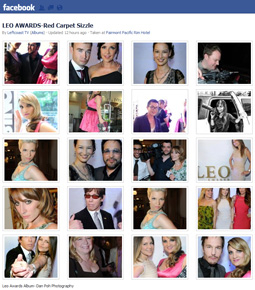 The 2012 Leo Awards Gala was a sea of beautiful, kinda sorta vaguely familiar faces. 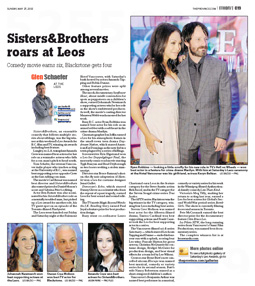 Carl Bessai’s small-budget film Sisters&Brothers and the APTN series Blackstone dominated the feature film and dramatic series categories at the Leo Awards on Saturday night. 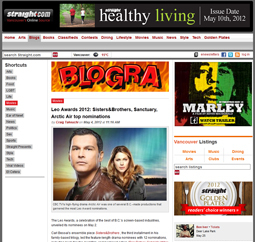 British Columbia’s film and television awards were co-hosted by Amanda Tapping and Robin Dunne, co-stars of the just-cancelled series Sanctuary (which had been up for 18 Leos and won four). 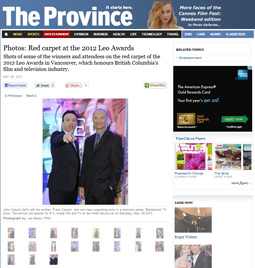 Shots of some of the winners and attendees on the red carpet of the 2012 Leo Awards in Vancouver, which honours British Columbia's film and television industry. 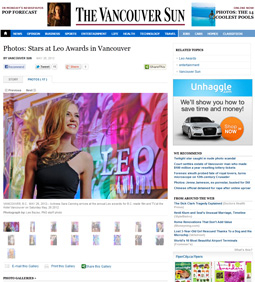 VANCOUVER - British Columbia celebrated its achievements in film and television at the fourteenth annual Leo Awards Saturday evening in the midst of a difficult time for arts in the province and across the country. 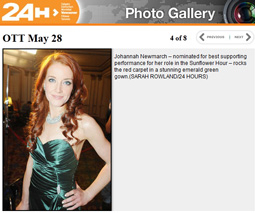 VANCOUVER, B.C.. MAY 26, 2012-- Actress Sara Canning arrives at the annual Leo awards for B.C.-made film and TV,at the Hotel Vancouver on Saturday May, 26 2012. A favourite among some Georgia Straight staffers, Doppelgänger Paul was given the Best Screenwriting honours during the first of two Leo Awards ceremonies on Friday night (May 25). 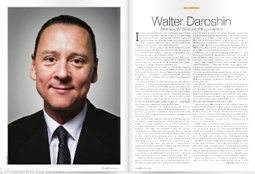 A first person narrative, thank you letter by Filmmaker and President of the Leo Awards, Walter Daroshin. 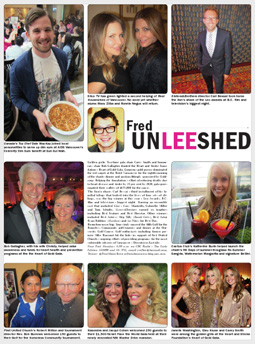 Fourteenth annual Award Ceremony Celebrates the Best Work by Locals on page D5. Fourteenth annual Award Ceremony Celebrates the Best Work by Locals. Gabrielle Rose interview on page 20 of WE. 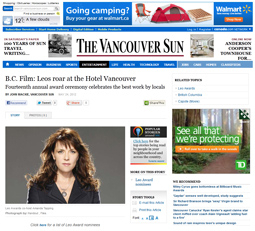 As Walter Daroshin puts it, part of his function as the president of the Leo Awards seems to be fighting what he calls “the melancholic impulse” of the B.C. film industry. 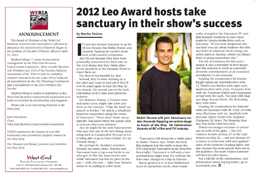 It's not just because Sanctuary is up for 18 Leo Awards that Robin Dunne and Amanda Tapping are excited about next weeks' Leo Awards ceremonies. 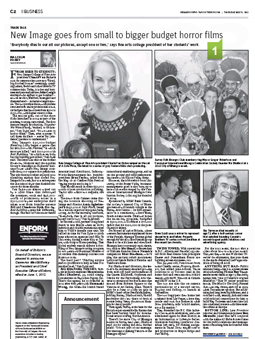 see page 6 for the related article. 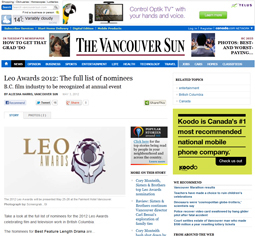 The Leo Awards, a celebration of the best of B.C. 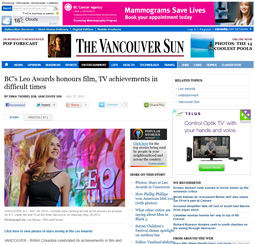 's screen-based industries, unveiled its nominees on May 2. 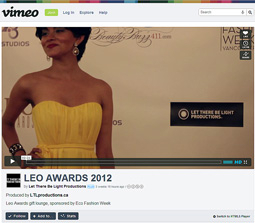 Leo Awards cooking episodes to promote awards. 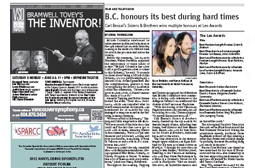 Other multiple nominees at B.C. upcoming film and TV awards include Carl Bessai’s Brothers & Sisters, a feature that garnered a dozen nods. 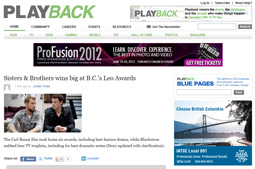 Take a look at the full list of nominees for the 2012 Leo Awards celebrating film and television work in British Columbia.